I like to think that I am open to life's surprises, and the last several months have been filled with some surprisingly wonderful unexpected experiences. In March I received an invitation from Yoga Journal to audition for a photo shoot; Reply "yes, I am intrigued," then more information will follow. I was hesitant because in this day of scams, where I have received e-mails supposedly from a dear friend stuck in London under dire circumstances, asking me to wire money to her, I immediately checked out a current edition of the magazine to see if the person contacting me was listed. I was gratified when I found the name listed among the contributing editors. Although it could have been someone using an identity that wasn't their own, I decided to reply to the invitation anyway. If there was a request for money from me, I would decline and get myself out of the exchange. Much to my relief the invitation was legitimate. I was flabbergasted when, after fulfilling all the requirements of the audition and what seemed like an interminable wait, I received news that I had been chosen to model 6 poses plus a lifestyle shot for Yoga Journals’ upcoming September 2013 issue, whichwill be released for sale on August 6. 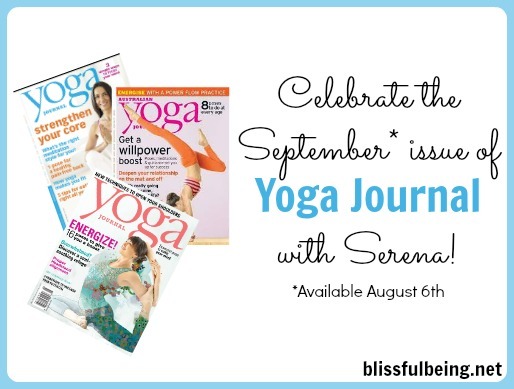 Look for it in the magazine racks or go online to http://www.yogajournal.com/. The photo shoot was a wonderful experience. Back in the day, (as they say) I was a hair model, and although I am short, I had the opportunity to do a runway show for a friend who was a student at the School of the Art Institute of Chicago (SAIC); so one of my guilty pleasures has been watching America's Next Top Model. Although I can live without all the drama the producers think is essential, I do like to watch each participant's transformation and what they go through for each photo shoot challenge. And so I felt somewhat prepared when I came to the job. I arrived with no expectations, open to however these people worked. Make-up/hair stylist, clothing stylist, Art Director, Managing Editor, Photographer and his assistant, all working together easily. I was thrilled they had clothes that fit and did not need altering, Modeling is work, no doubt about it, but it is fun work, and if ever invited again, without hesitation I would say yes immediately. Please do me the honor of checking out the September issue of Yoga Journal. I’ll even autograph your copy (wink, wink).